Do you have USB flash drive, portable hard drive? What kind of file do you carried with these mobile drive, only music, video, document? or you want carry your favorite software such as browser with your full favorite links? If you simple copy software to mobile drive it does not working, so you need potable application for your software. 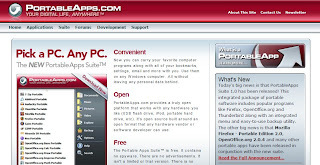 Portableapps offers you several portable applications, from browser to anti-virus software, just download them into your mobile drive you do not need other additional software. You can use it with other PC, no worry about your data with your software. It is free.